The EVO 2000 indoor table tennis features a high quality 16mm premium top with melamine coating that gives a superb and long lasting play surface. It has a sturdy steel construction with 3/4 steel side panel and an easy and quick folding system called the Dunlop QuickLock DRS. The integrated net & post has height adjustment, (permanently staying in place when table is folded,) plus a comprehensive high quality accessory pack is included. 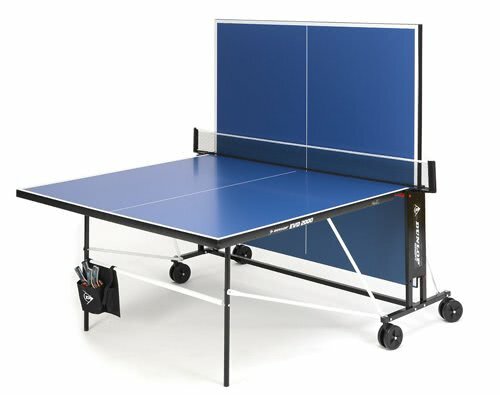 Good value table for what is a full on proper table tennis table. I thought buying a 'home' model would mean it wasn't as good as the ones in our local youth club, but if anything this one is better built and less likely to shake if you have to touch the table for any reason. Delivery by XPD to an accessible ground floor location, within seven days of your order (on orders placed Monday-Friday). XPD will call you to arrange a convenient delivery slot. Please ensure you leave a working phone number with your order. Please remember to visually inspect the packaging when your product arrives. If there is any obvious damage please inform the driver and ask to inspect the goods. In the unlikely event that damage is found please reject the goods and ask the driver to return. The signature of the person accepting the goods is proof that the delivery has been successful and you are happy with the condition of the product. Free delivery is to England & Wales only. For other UK areas please contact us for a delivery quote.